The American Board of Internal Medicine (ABIM) is working diligently to align the enhancement of its Maintenance of Certification (MOC) program with the Assessment 2020 Task Force report, including the recommendation to replace the 10-year MOC exam with more meaningful, less burdensome assessments. As the program evolves, the goal is to ensure the clinical content is relevant to a broad cross-section of physicians. As part of that journey, this past year, in response to physicians’ requests for an MOC program that better reflects what they see in practice, ABIM invited physicians to review the Internal Medicine MOC exam blueprint – the content outline used to create examinations. ABIM sought feedback, and internists rated clinical topic areas by relative frequency and importance in practice. These ratings informed the revision of the Internal Medicine MOC exam that was administered in the fall of 2015. Following the success of that process, ABIM will be inviting board certified physicians across all our subspecialties to review MOC exam blueprints in their disciplines. Read a news release issued about this today. We’re very excited to offer physicians the opportunity to provide input on the MOC exam blueprints, and we’ve been gratified by the number of physicians who chose to engage in this process. As we learned through conversations this past year, many of you are eager to contribute your perspective on what assessment content you find most relevant in practice. The blueprint guides future assessment content, so physician feedback is key: Your input will inform our periodic updates of the subspecialty MOC exam blueprints. No matter what form ABIM’s assessment ultimately takes, it will need to be informed by front line clinicians sharing their perspective on what it is important to know. As blueprints open for review in each subspecialty, you will receive an e-mail invitation with instructions on how to access reviews for subspecialties in which you hold valid certifications. You can also find a link to access the review by signing into your secure My Home Page on ABIM.org. The estimated time needed to rate each blueprint section varies and could range from approximately 15 to 60 minutes. You can choose to review one section of the blueprint, multiple sections or the entire blueprint. Your participation is critical, as we are seeking a timely and representative response in order to update subsequent MOC exams and inform any future assessment. As ABIM enhances its assessment development process, it is also engaging the internal medicine community to consider how ABIM can continue to improve its knowledge assessments. All ABIM Board Certified physicians were recently invited to complete a survey about their MOC exam experience and potential assessment models ABIM is exploring in response to the recommendations of the Assessment 2020 report. 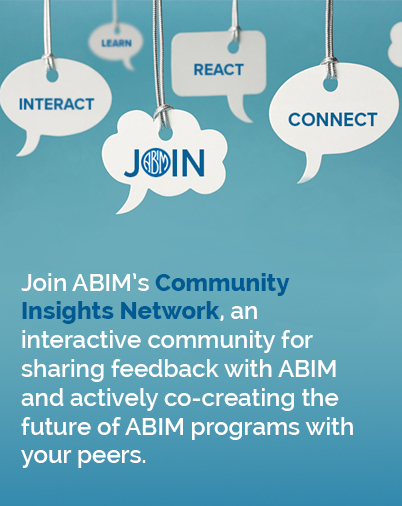 We welcome your feedback as we explore ways to improve the assessment process and encourage you to subscribe to the Transforming ABIM blog to learn more about how your input is helping create a more relevant MOC program and other ways you can participate.